The VSAC Roadmap to College is the one-stop shopping resource for college information and planning in Vermont. It’s sponsored by the Vermont Student Assistance Corporation (VSAC). Users will find the usual timeline information and high school preparation information. The Apply section includes information on the college search and application process as well as resources for the application essay and recommendations. Although many of the resources are links to other websites, there are also a number of PDFs available for downloading including a 35 page Paying for College Guide and a comparison of the SAT and ACT. You can sign up for reminders by email or postal mail. Some of the areas link back to the VSAC website that has the same information but not in as a user-friendly format. This includes information on Vermont Grants as well as a calendar of events listing financial aid workshops. Students interested in starting at a community college and transferring should visit Community College of Vermont for a list of articulation agreements. It also has information on the Community College of Vermont study abroad program. 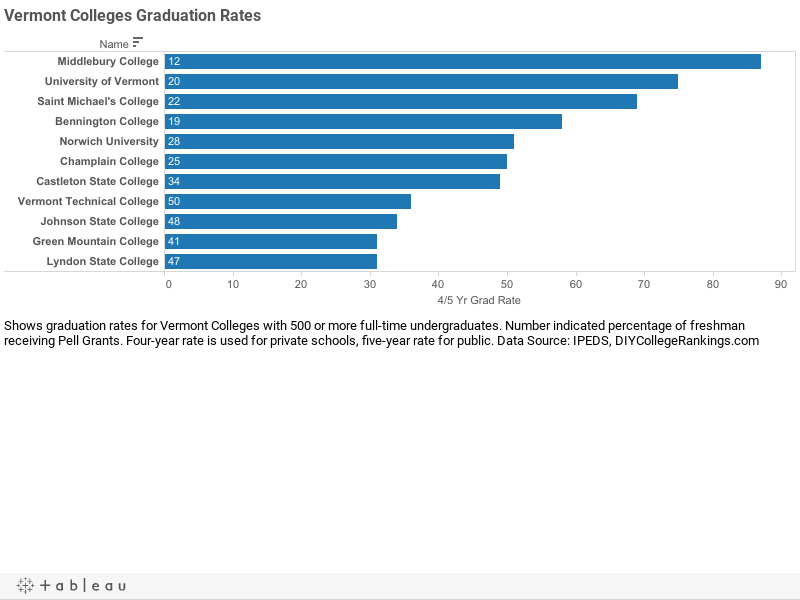 There are 11 four-year Vermont colleges with 500 or more full-time undergraduates according to the Integrated Post-secondary Education Data System. Approximately 41 percent of students attend one of the six private Vermont colleges while 59 percent of students attend one of the five state institutions. The private Vermont colleges have an average four-year graduation rate of 57.7% and the public universities have an average five-year graduation rate of 45%. Six Vermont colleges meet the DIY College Rankings 50-50 profile requirements. The average SAT score for college-bound seniors in Vermont was 522 for Critical Reading and 525 for Math. The 75th percentile scores were 600 for Critical Reading and 600 for Math. Of the schools that reported SAT scores, four colleges had 75th percentile scores equal to or higher than the state in both categories.